For the next three months, VocalEssence will feature its education programs to promote Music Makes Us Whole, an initiative that brings together non-profit and for-profit organizations in Minnesota to raise awareness about the ways a rich music education enhances a child’s development. This month, we’re highlighting VocalEssence WITNESS School Program and Lullaby Project. The VocalEssence WITNESS School Program engages students and teachers inside and outside of the classroom through a multidisciplinary study of African American history that combines music, dance, social studies, and other subjects. VocalEssence leads in-school workshops with experienced Teaching Artists for students grades 4-12, provides teachers with professional development and classroom resources, and invites schools to attend the VocalEssence WITNESS Young People’s Concerts, featuring VocalEssence singers in a professional concert hall. Throughout the 2016-17 school year, over 6,500 students from 54 schools in Minnesota are learning about sanctuary as part of the VocalEssence WITNESS School Program. On Feb. 16, 150 students from four local high schools and middle schools will perform songs of freedom, liberation and sanctuary at the Young People’s Concerts with the VocalEssence Chorus and guest artist Melanie DeMore. The concert, called VocalEssence WITNESS: Underground Railroad, crystallizes a multidisciplinary curriculum of themes, stories and music that thousands of students are learning about throughout the school year. Launched in 1991, the VocalEssence WITNESS School Programs explore a different theme each year, giving students an opportunity to learn about African American heritage and art, as well as providing students the special opportunity to see a professional performance at a major concert hall. Learn more about the VocalEssence WITNESS School Program. Lullabies are powerful tools for parents to bond with their children. Research shows that writing a lullaby helps build a parent’s sense of accomplishment confidence, and strengthens bonding with their child, which enhances the child’s attachment and development. The Lullaby Project — a national program out of Carnegie Hall — pairs professional artists with mothers to write personalized lullabies for their babies. VocalEssence is in its second year offering the program. This year, VocalEssence partnered with Longfellow Alternative High School to help five young African-American mothers write lullabies for their babies. The mothers met with VocalEssence singers to write the songs over the course of fall 2016. Each mother wrote the lyrics, while the VocalEssence team assisted with the more technical aspects of each composition. The lullabies were recorded and shared at a private listening session with family and friends in January. Learn more about the Lullaby Project. VocalEssence ¡Cantaré! 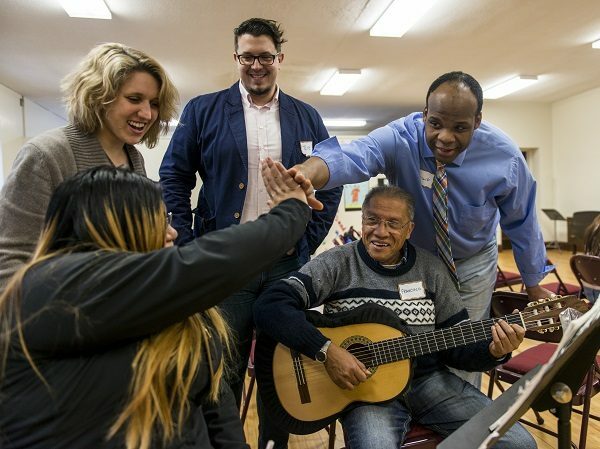 brings composers from Mexico into Minnesota classrooms. 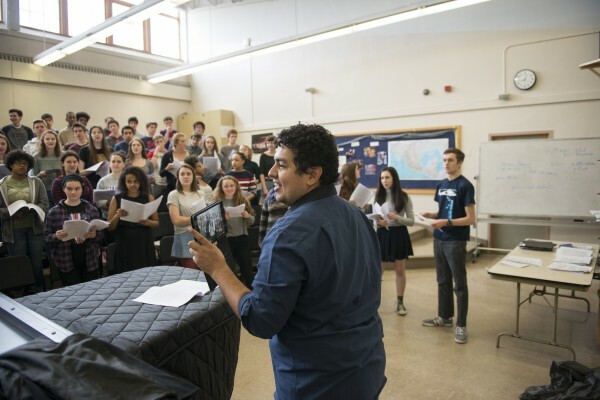 Each year, composers participate as artists-in-residence at elementary, middle and high schools and community centers, writing new music for each participating choir to perform. VocalEssence provides classrooms with teaching resources that teachers can integrate into the curriculum before and after the composers’ residencies. In the 2016-17 school year, Mexican composers Samuel Pascoe and Rodrigo Cadet will spend four weeks over the course of three visits with elementary, high school, and community choral singers, exploring Mexican cultural and choral music traditions. Their works will premiere at the VocalEssence ¡Cantaré! Community Concert at Ordway Concert Hall in St. Paul on May 2, 2017 at 7 pm.